Neutral tones, expansive windows, and natural shapes characterize the Mediterranean style architecture. Relaxing and inspiring, Mediterranean and Tuscan style homes have a timeless appeal that draws people in, making them feel comfortable and welcome. Mediterranean style architecture, like our Sammamish Tuscan home, features a traditional color scheme of dark beige sandstone on their exterior. One of the most defining characteristics of these homes is the color scheme. 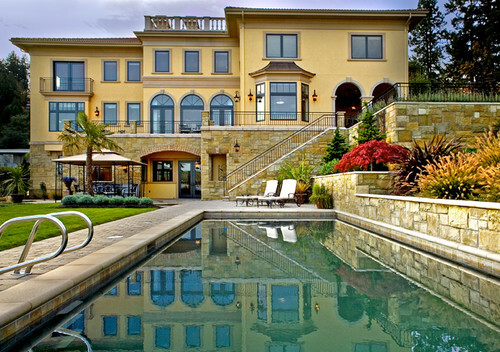 Much like our Sammamish Tuscan masterpiece, Mediterranean houses use a dark beige sandstone to form the exterior. This natural earthy shade is frequently accentuated with black, maroon, or dark brown. For a more modern appeal, architects will implement black railings and window frames. Brown accents create a more traditional look. Landscapers enhance the Mediterranean feel of these homes with greenery reminiscent of the lush, verdant countryside of Tuscany. Many Mediterranean homes are accompanied by spacious, luxurious backyards with features such as herb gardens and in-ground pools. Inside these beautiful homes you will find arched doorways, high ceilings, and pillars. These striking characteristics add a sense of elegance and nobility to the home. The same neutral shades and dark wood accents from the exterior walls carry into the home, creating fluidity as you move from the vibrant outdoors to the bright and welcoming inside. Dark wooden cabinets and stone counters augment the kitchen’s clean and dignified ambiance. Large, picturesque windows line the sides of Mediterranean style houses, providing stunning views of the surrounding landscape. Often with rounded tops, these windows provide plenty of natural sunlight which illuminates the lustrous materials used throughout the home. Contact Gelotte Hommas to learn more about the Mediterranean homes we’ve designed. We’d be honored to help create your Mediterranean or Tuscan-inspired home.